The objective of the forum was to contribute to the mobilization process in Europe leading up to UNESCO’s 1998 World Conference on Higher Education. The forum focused on a European agenda for changing higher-education systems to meet the needs and challenges of the 21st century, with the following themes: teaching and learning; preparation for the world of work; advancement of knowledge through research; and transmitting European cultural values in a global context. The delegation report describes the structure and sessions of the forum, as well as the main conclusions concerning each of the themes. Ministers of education in the Americas held their fourth meeting in 2005, in Scarborough, Tobago. The Canadian delegation was led by the Honourable Peter Bjornson, Minister of Education, Citizenship and Youth, Manitoba. The meeting was divided into two themes: "What Do People Think and Know About Democracy?" and "From Civic Education to Citizenship Education." 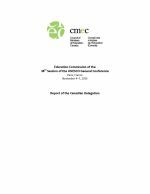 This report highlights the key points of discussions and presentations, and provides overviews of the speeches made by the Canadian Head of Delegation on education for democracy and the future of education.